The Caledon spa has been known for centuries. In the old days its curative powers were used by the local San and Khoi populations. In the 17th century the Dutch discovered the baths curative powers. In 1894 a lovely Victorian sanitarium and hotel was built close to the baths and it became the haven for the well to do English population of the Cape at that time. Over the years it fell into disuse and became a horrible green swimming pool which one was scared to get into. Fortunately that's all history now. The Caledon spa has been refurbished and is included in the complex of the Caledon casino. The Victorian bathhouse has been restored to its former glory and comes equipped with Turkish baths, cascading pools, treatment rooms and saunas. For those who love being pampered its the place to spend a couple of days relaxing. The Goudini Spa is found in the mountains just outside Worcester a couple of kilometres off the N1 highway. It has been there for many years and was established by the ATKV, an organisation that looked after the interests of Afrikaans railway workers. The resort has been built up over the years and is now an extremely popular holiday destination and Conference facility. The resort boasts a 54 site caravan park, all of which are electrified and a number of Rondavels and bungalows which sleep between four and eight people in comfort.The whole complex is beautifully laid out with lawns and trees. The hot baths have been refurbished a number of times over the past few years and are a really pleasant experience especially during the colder winter months when one can soak in them for hours. This spa is situated in the small town of Barrydale about two hours drive from Cape Town in the Little Karoo, a semi desert region of the Western Cape. The spa is surrounded by five Klein Karoo mountain ranges. This spa has much to offer and has various styles of accommodation for the visitor to utilise. Most of the buildings in the complex date back to the early 1900's. There is also a campsite for caravanners and a special grassed area for tents. The caravan sites are electrified. The ablution block features two sunken Roman baths. A well known place a few kilometres north of Barrydale is Ronnie's S e x Shop. Anybody seeing this name would most certainly get the wrong impression of the place. It is in fact a very popular watering hole and is well known to people who live and visit the area. The three spas mentioned above are all found to the east of Cape Town whereas the next spa is found to the north. 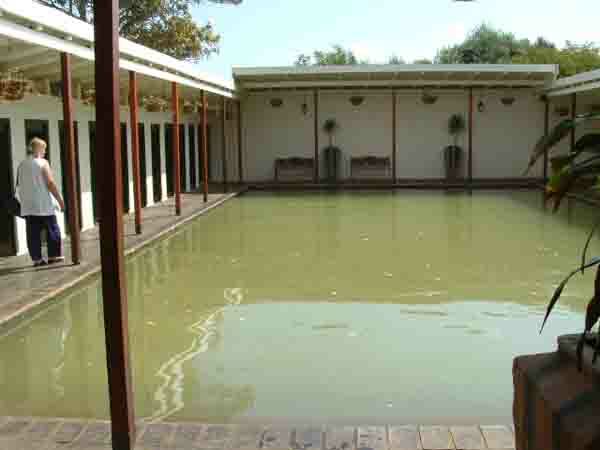 �The Baths� as the spa is known are found in the Citrusdal area . This spa has quite a history which begins back in 1739 when Jan Cruyhoff suggested to the authorities that a military post be established on the farm where the baths were so that they could protect the local farms from the bushmen that raided the area. After changing hands many times the baths were eventually bought by James Mc Gregor in 1903 and the Baths are still run by the family today. The baths boast a number of chalets, Victorian buildings and duplex flats for visitors to hire. They also have a campsite with 15 stands for caravans. The water in the natural hotsprings is 43 degrees centigrade and the eye of the spring delivers a 105000 litres of hot water per hour. The area around Citrusdal has much to offer the visitor. There are mountain trails into the Cedarberg for hikers, a wine cellar for wine lovers and much much more. Feeling a bit cold as winter is approaching in the Northen hemisphere. Pop down to Cape Town and come enjoy our spas.